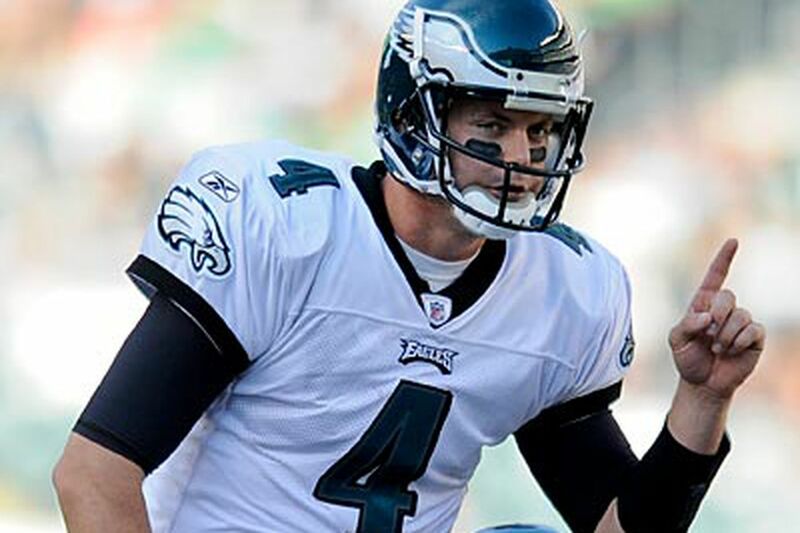 At this point, it is safe to assume that Kevin Kolb will not be traded before the NFL draft. Three months of breathless speculation and the occasional report about where the Eagles backup quarterback would be dealt were all for naught. With 11 days left until the draft, Judge Susan Nelson has yet to rule on Brady v. NFL. Even if she were to grant the players an injunction, most observers agree that she will issue a stay pending the owners' appeal. So the lockout would still be on. That will shift the focus to after the draft and what kind of deal the Eagles can pull off if the lockout is lifted or when a collective bargaining agreement has been reached. While the likelihood of a trade appears less certain after the draft, the Eagles' willingness to unload the 26-year-old makes it likely they will do whatever it takes to get something in return before the regular season. The number of teams in need of a quarterback and the dearth of ready-made prospects in the draft pool should give the Eagles enough leverage to receive what they consider proper compensation for a budding starter. Because the draft is likely to take place before any free agency, the Eagles will have a strong sense of which quarterback-needy teams are in desperation mode following the three-day event. Ten to 12 teams are without an incumbent quarterback for next season, and six to seven draft prospects have grades that project them as second-round or better picks. That could leave as many as a half-dozen teams still in search of a starting quarterback. The need for quarterbacks has inflated the value of this class, especially the talented but raw Cam Newton, who many now project to go No. 1 overall to the Panthers. The Eagles know all this. That's why coach Andy Reid, president Joe Banner, and general manager Howie Roseman aggressively pitched the case for trading Kolb at the owners meetings last month. They hardly made the defense for keeping Kolb: insurance, at a relatively low cost, in case Michael Vick gets injured. The Eagles have too many holes on defense and the offensive line to justify keeping a backup quarterback in the last year of his contract. A number of backup-caliber talents are on the market - Marc Bulger and Seneca Wallace, to name two - and the Eagles still have Mike Kafka. Despite concerns about the second-year quarterback's arm strength, the Eagles have a high opinion of Kafka. Apparently they're not the only ones. They have received trade offers for the 23-year old, according to one league source. There are obvious obstacles to trading Kolb post-draft. For one, the Eagles can't receive 2011 draft picks - the gold standard in any potential deal - in return. And no, the Eagles cannot have a wink deal with another team in which they draft players for each other only to exchange them at a later date. If they want a first-rounder for Kolb it's going to have to be a 2012 pick, which would do nothing to aid their 2011 hopes. Such a trade would be pointless. But the Eagles would be willing to part with Kolb, Reid and company said last month, if a player that could immediately benefit the Eagles was part of the package. This may seem like a daunting task. And it is. The Eagles would need to find a partner willing to meet their draft-pick demands and one with a player they covet that said team is willing to part with. Player-for-player trades are rare in the NFL for a reason, although Roseman has already pulled off several during his short stint as GM, one involving three teams. The 35-year-old is not lacking in audacity when it comes to player acquisitions. Even though teams cannot have trade discussions involving players, it hasn't hampered the Kolb talk. On Friday, there was a report that Kolb's desire for a multiyear contract extension has "drastically reduced" the number of suitors for a quarterback who has started only seven career games. It's valid to suggest that doubts over Kolb's ability have scared away potential trade partners. He has a career 73.2 passer rating. But the contract is not an issue. If a team is prepared to part with a first-round pick for Kolb - or even a second rounder - that alone sets the bar fairly high. What team would part with a high pick and not try to lock up what it considers a franchise quarterback? Matt Cassel received a six-year, $63 million deal after the Chiefs acquired the quarterback and linebacker Mike Vrabel in exchange for a second-round draft pick in 2009. Two years earlier, the Texans surrendered two second-round picks and swapped first-rounders with the Falcons for quarterback Matt Schaub. In Atlanta, Schaub played even less than Kolb has with the Eagles and still secured a six-year deal worth $48 million. And Kolb wants to start. He is not looking to break the bank. In two weeks, the draft will be over, the lockout will almost certainly still be in place, and Kolb's name will continue to be bandied about in even more outrageous trade rumors.